This pattern, however, does not inspire me to knit. It does move me to sympathy for the woman with the tight smile in what looks like a very heavy and itchy dress, and for the poor guy in the odd tunic sweater, who is thinking "Man, that summer roofing job is sounding a lot better than this modeling gig right now." Does anyone know when the models in these kinds of ads started to look so self-conscious? There are models from the 50s doing equally goony things, if not even more so (lots of those ads involved men holding pipes! ), and they look completely unaware of their potential to be targets of ridicule. When was the moment when people realized that pretending to dance in front of a camera was inherently silly, and stopped making a good-faith effort? I wonder–although I do not knit–whether one could make a dress like this in a different yarn. Do knitting patterns let you do that? Because a dress like this might be pretty cute in a finer, softer knit and maybe in monochrome. I always wonder about those pebbly wool clothes that you find at the thrift store–who wore them? Why? Did people just accept that they should be constricted and itchy as a matter of course? 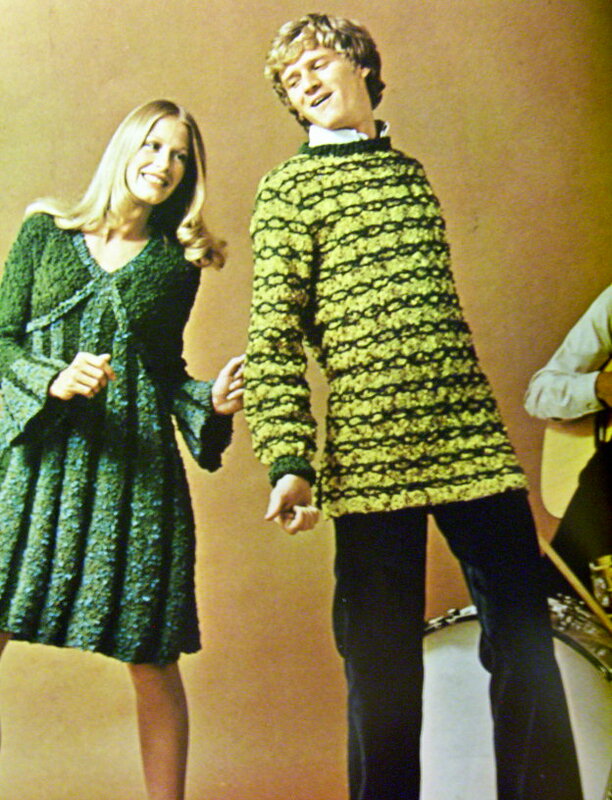 If anyone is really curious about the incredible (and hilarious) variety of inane modeling postures featured on knitting patterns, you will have a blast visiting Threadbared (one of Dress a Day’s links). Warning: if you check it out while you are at work, be prepared to stifle or explain your guffaws! Holy carp, that dress looks like it was knitted out of Astroturf. Slightly moldy Astroturf! Is it any wonder the model looks self-concious? I’d feel sorry for her if I could feel sorry for a beautiful young blonde thing. I used to knit a lot. You would have to line this creation, it would seat when you sat down for longer than 5 mins and it would go saggy and lose it’s shape in the wash, even if you hand washed it. It would also take a century to dry. Not a good look! Best left to the model in the picture I think. No, come on! I love it. In a camp way. The dress, I mean, NOT the tunic jumper, for which there can be no excuse. OK, forget the self-conscious woman. It’s the MAN that intrigues me! Not a shred of self-consciousness there! He thinks he’s so hot in that Gramma-loves-her-Packers creation! Right down to his thumb, man. He thinks she digs him. She’s just thinking about getting her measly modeling paycheck and blowing the joint. And how is that man in the background playing both the guitar and the drums at the same time? Anon: it isn’t necessary to line a knitted dress anymore than a sewn garment. It’s a matter of preference. You could wear a slip with it if you like. As for the garment “seating out,” this also happens to stitched garments. Ever seen a saggy 100 percent cotton skirt? Yep. But this can be easily corrected with a little pressing with your handy-dandy iron. Knits need to be washed and reblocked, usually with a touch of steam from a kettle or the aforementioned iron. The style lines of the knitted dress are groovy. I’d like to see it in a soft, fine yarn and smaller gauge. Maybe pale pink and chocolate brown perhaps? or even one solid color. I believe that there are programs out there for transferring patterns to different types of yarn and gauges. Personally, I can’t see a hand knit dress looking great on anyone who’s past the ripe old age of 5. Oh, there are programs? Now you tell me. I just spent the better part of a flight from Portland to Minneapolis doing longhand calculations on the back of my knitting magazine, and I think the sweater I’ve started is about 2/3 the size I meant it to be . . .
Oops, sorry about the double post.